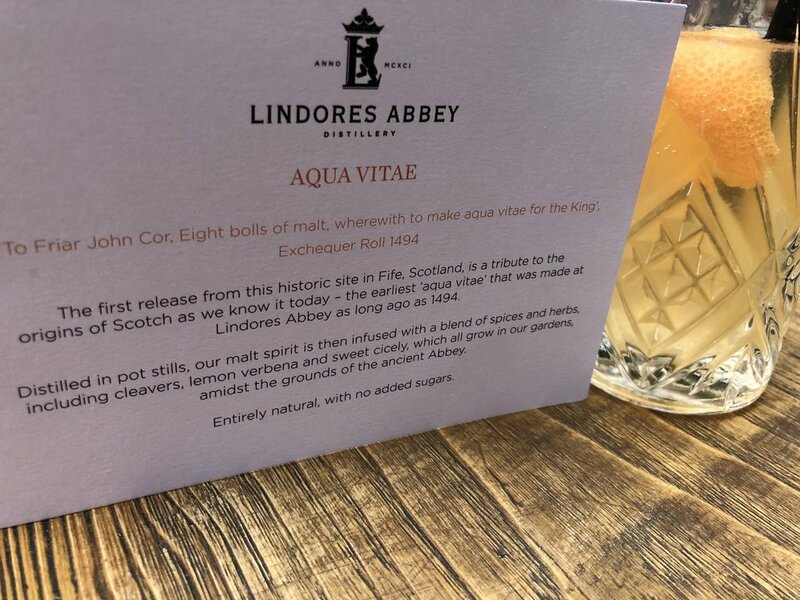 A taste of history in every dram when you drink the water of life at Lindores Abbey. The words that launched a brand and whisky itself. Lindores Abbey is one of the newest yet, the oldest distillery in the world. 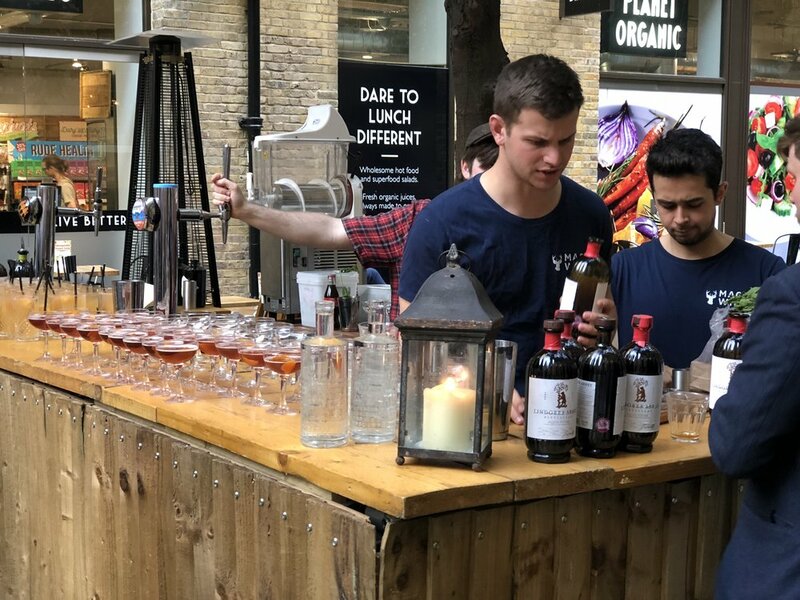 Jeremy Webb sampled their product, a new spirit called Aqua Vitae. 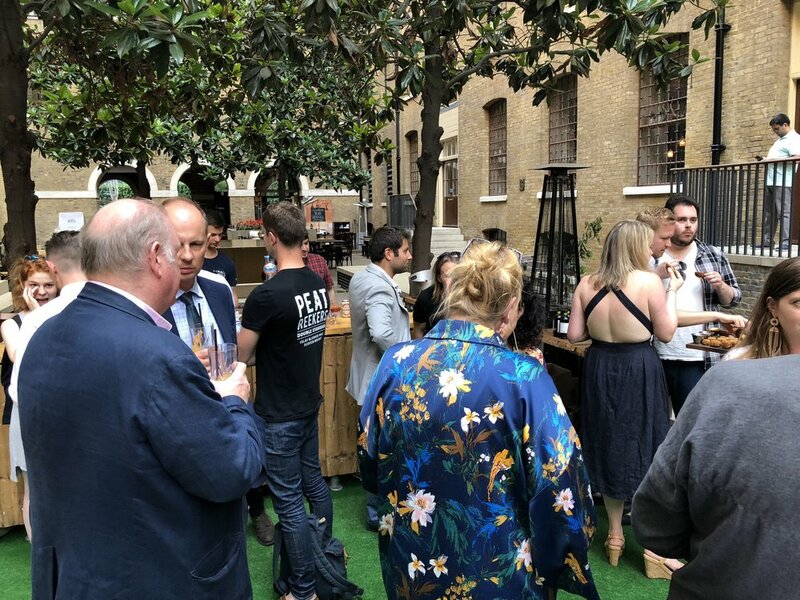 I was invited to attend the launch of a new drink on Monday 2nd July at Mac and Wild in London’s old banking district. Before attending, all I really knew about the drink, was it’s from Scotland and based on a whisky. This all changed after speaking to and listening to the McKenzie-Smith family, owners of Lindores Abbey in Perthshire. On arriving at the launch I was greeted by Murray one of the company’s Sales Managers, who immediately got me a cocktail made from Aqua Vitae. I was welcomed into the family atmosphere which Lindores has in abundance. He started to tell me about the origins of the company which I soon found out lie hand in hand with the origins of Whisky itself. The cocktail was "Rest and be thankful" a mix of Aqua Vitae, pink grapefruit, ginger ale and sea salt, served in a tall glass with ice and a slice of grapefruit. Very refreshing on what was a hot evening in the city. I met the Apothecary the man who works the magic in the distillery. Tim Foster takes pure water then mixes it with malt and the herbs and plants grown in the Abbey's garden, to produce Aqua Vitae. This is as near to the original blend Tim can get after many years of testing and sampling. I was informed that Aqua Vitae cannot be called a Whisky until it is three years and one day old, so until then it is labeled a New Spirit. Lindores Abbey intends to produce a Whisky which they are going to age for at least five years, giving it greater notes and smoothness. Helen Mckenzie-Smith one of the owners of Lindores Abbey, and a superb host. The next cocktail I sampled while talking to Tim and other staff was the Awakening, AV mixed with Oloroso sherry, simple syrup and fresh mint. Good job it was a small glass as it packed a punch while delivering lovely flavour. While I was taking some photos for this article, Helen Mckenzie-Smith came over and introduced herself. It was like talking to someone I had known for years. I was immediately welcomed and made to feel at ease and thanked for attending. Helen is married to Drew they own the distillery after inheriting Lindores Abbey. Helen told me it had taken over twenty years to reach this stage of having a drink to sell, the story of which could literally be a film. I will cover the full story in a larger feature after I have visited Lindores Abbey at the kind invitation of Helen. Simply the family never knew of the importance of their land and the Abbey in the history of Whisky until a Journalist visited over twenty-three years ago. Michael Jackson read through the Exchequer Roll in the Abbey and discovered a phrase in Latin which reads " To Friar John Cor, eight bolls of malt, wherewith to make Aqua Vitae for the King"
This confirmed that the site was the first place in the world to make the water of life, now know as Whisky. Helen then introduced me to her daughter Poppy who was the person who had invited me to attend the launch, but I had not met in person. (Social Media is good for some things, and connecting is one of them). Poppy is a writer, working for Bonhams Auction house full time, and in her own time handles the PR for Lindores. It was great to finally meet Poppy who I have been exchanging Tweets and emails with for over a year, through our love of classic cars. She organised the launch at Mac and Wild which is a Scottish bar and restaurant in the heart of London. They produced some delicious snacks for the evening, all based around Scottish ingredients. 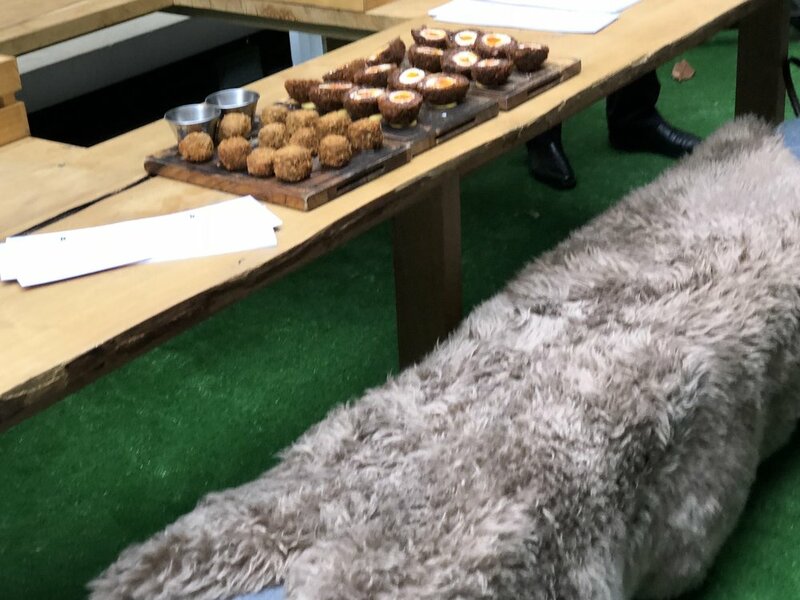 haggis balls, veninson scotch eggs were both delicious. The Mac and Cheese fried ball, wow, wow, wow. Gorgeous. I mingled with other guests discussing the great cocktails, one of which was the Last Word which brings me nicely to a close. It is AV mixed with Green Chartreuse, Maraschino liqueur and lime juice. Very fresh, fruity and fab. Helen had suggested I finish with a shot of Aqua Vitae followed by a shot of pickle liquor to stop any hangovers, but I had to get a bus then train back home so I did not partake for fear of not getting off my stop at the station. The last word until I visit beautiful Scotland and Lindores Abbey is to say a huge thank you to Helen, Drew and Poppy for inviting me and being great hosts, and to all in the company what a fantastic product you have. I can't wait to sample the five-year-old Whisky. A visit to the Abbey allows you to walk where the monks produced the spirit using herbs and plants grown in their gardens. The company can plan accommodation on site if you wish to take a holiday or short break in the region.